Clubs/Bars/Lounges, Concerts, Live Events, Weddings, and Corporate/Private Events. Ramin, otherwise known as DJ Mova, has quickly created a familiar name in Washington DC Nightlife; his unique sense of musical taste and foresight solidify both the ascension and longevity of his career. Armed with a youthful, yet sharp musical ear, DJ Mova began DJing college events, both charitable and interfraternal. He quickly became a staple around the campus and would eventually transition from college events to club based performances. A native of Washington DC, DJ Mova has played and headlined at various local marquee venues. With musical influences such as A-trak, Craze, Ruckus, and Vice fueling his sets, DJ Mova’s performances are captivating. His sets include a range of Open Format Music including: Club, Dance, House, Top40, Electric, Progressive, Hip Hop and International. Over his 9 years of experience, DJ Mova has played for high profile clients in numerous cities. Events in Ocean City and Pittsburgh opened up doors to working with clients such as Subaru of America, hosting/DJing their events at FedEx Field and Portland International Raceway. Most notably, DJ Mova has had special opportunities to work with VIP/Live Nation performing as the VIP DJ for Rihanna’s ANTI World Tour featuring Travis Scott and most recently, performing as the VIP DJ for Jay-Z and Beyoncé's OTRII World Tour featuring DJ Khaled. He has also worked the official afterparties for Bruno Mars' 24k Magic World Tour, Britney Spears' Piece of Me World Tour, and Christina Aguilera’s Liberation World Tour at the MGM National Harbor. DJ Mova has shared the decks with artists such as B.O.B, Clinton Sparks, Reid Stefan, and Pete Wentz of Fall Out Boy. Blackbaud, Budweiser, BVLGARI, NY&CO, Politico, UNICEF, and Wells Fargo to name a few. His experience performing at a variety of venues and for a wide range in demographics can also scope to private events, corporate parties and of course, weddings. He has perfected the art of catering to all age groups and having the poise, charisma and confidence to host both formal and informal events. A-Town, Baltimore Convention Center (Baltimore, MD), Bar Bao, Barcelona (Washington, DC), Blossom at MGM National Harbor, Café Asia, Capitale, Capitol Skyline Hotel, City Tavern Club, CO2 Lounge, Cruze Bar (Pittsburgh, PA), Current/Rosebar, Darna, Dirty Bar, Don Tito, Eden Nightclub, FedEx Field, Felt at MGM National Harbor, The Gaylord National Resort & Convention Center, The GOAT, Heist, HighMark Stadium (Pittsburgh, PA), The Huxley, Kabin, Lima, Living Room DC, The Living Room at W Hotel (Austin, Texas), Lost Society, Mad Rose Tavern, Malmaison, Manor, MIA, Mist, Ocean City Convention Center (Ocean City, MD), Opera Ultra Lounge, Pamplona, Park Hyatt, Portland International Raceway (Portland, OR), POV at W Hotel (Washington, DC), Provision DC, Royal Farms Arena (Baltimore, MD), Skybar (Pittsburgh, PA), Tattoo Bar, Washington National’s Park, The Watergate, The Willard Intercontinental, 4935 Bar and Kitchen, 901 Lounge, and more. - Over 9 years of professional DJ experience in Club/Bar/Lounge, Concert, Live Event, Weddings, and Corporate/Private Events. - Truly Versatile Open Format Style, with ability to read crowds and adapt to various demographics. - Vinyl DJ by preference. The philosophy behind DJing events is quite simple, it is more than a gig, more than another sale; it is a relationship established on trust and comfort. With DJ Mova you can trust that your next big event will be in the hands of a versatile and well established DJ. Find comfort that your DJ is backed by a proven track record of a plethora of experience working diverse crowds. Open format means flexibility. Whether the hottest new club, the popular hangout bar or an intimate lounge, DJ Mova can cater to all types of crowds with an eclectic music selection. DJ Mova can regularly be found rocking venues throughout Washington DC, Maryland, and Virginia and local exposure has opened doors to select venues across the United States too. His broad range and ability to reach across genres is set to bring the house down, no matter the location, with a blend of Top 40, House, EDM, Hip Hop, Throwbacks and International. Each couple is different so why should every wedding be the same? DJ Mova brings the upbeat vibe that today's couples desire! By providing custom tailored packages with a-la-carte services, clients can rest assured that DJ Mova caters exactly to their unique desires and budgets. Have no worries on your wedding day; clients can enjoy the benefits of partnerships with industry-best vendors, unlimited event planning consultation, a resourceful music selection and organizational tool, and full insurance coverage. In addition to two thorough planning meetings, DJ Mova puts the thought into your wedding so that you don't have to. Trust that your most important day will exceed every expectation you have! Whether it's an in-store event, work conference, or your company's next holiday party, DJ Mova can accommodate corporate events of any size, for any occasion. Create an experience for your company by incorporating lighting design to professionally tuned audio systems. Exclusive add-ons can bring life to any atmosphere; capture memories with preferred social media kiosks or photobooths, confidently display presentations and slideshows, or proudly project your logo on any surface. 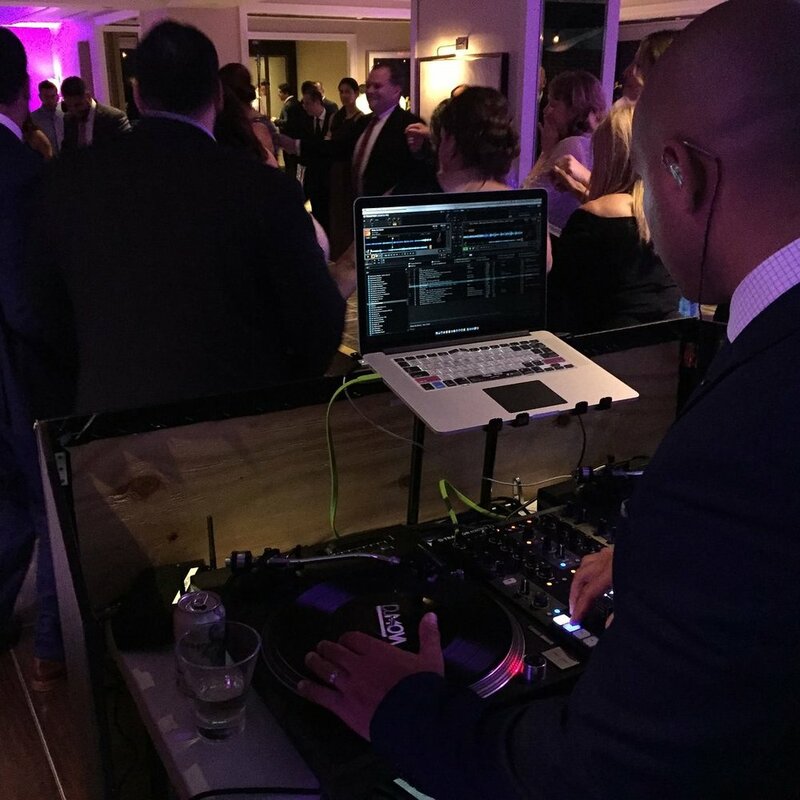 Whatever your next corporate event may entail, DJ Mova is ready to take it to the next level! Anniversaries, birthdays, and just about anything you could put your mind to! Hosting parties is already taxing enough, and sometimes, iPod or Spotify playlists just aren't enough to get people up and dancing. Whatever the occasion may be, there is no better way to throw a party than to rock with DJ Mova!